The Gypsies, Roma or Romany have a long history of freedom and travel, passing on their ancient knowledge of nature, the elements and the power of the earth and its fauna and flora within families and traveling groups. They are first recorded traveling in Europe during the middle ages, coming originally from Northern India to criss-cross and trade then settle in various places, such as Romania, Hungary, Germany, Poland, Czechoslovakia, Bulgaria, Italy, Switzerland, France, Spain and from Spain to Ireland as well. From their ancient home in Northern India and the foothills of the Himalayas the Gypsies brought a deep mysticism and a great store of ancient magical knowledge. Throughout the ages there were often persecuted and chased away so that they evolved a philosophy of "living on the move" yet always remaining in balance with nature around them and never letting their fiery passion for life wither. They are well known as great story-tellers, great "seers" - they are credited with bringing the Tarot to western Europe- great horse breeders and artists. All through Europe they can still be found, sometimes still living in colorful caravans, the women dressed in vibrant long skirts and blouses adorned with many coins and talismans. They are musicians, artists, poets, singers, metal workers (the Irish tinkers) and are involved in all manner of creative endeavors. Gypsies carefully guarded their ancient knowledge throughout the ages and their travels and continue this day to practice their magical rituals and spells. Most include the use of fire, herbs, candles and prayer. 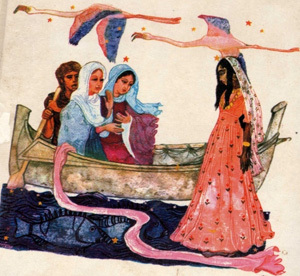 Once a year, European Gypsies pilgrimage to Saintes Maries de la Mer, where it is believed Marie Salome, Marie Jacobe and Marie Magdalene arrived in a barque with no sails and no oars. Floundering off the coast of the Camargue in southern France, they were rescued by Sara-La-Kali (the dark one) who threw her cloak onto the waves and thereby walked to their barque and pulled it ashore. A chapel was built there eons ago, in their honor and it is the goal of the pilgrimage. It is situated in the Rhone Delta, south of the town of Arles, where the pungent herbs such as lavender grown on the foothills of the Alps linger day in day out. In June each year, thousands of gypsy caravans arrive in the village and families converge towards the chapel. As a child growing up in France I was always strongly attracted to the bands of gypsies who came up the Loire valley in early fall to hire themselves out for "les vendanges", the grape picking season, an enormously difficult and back-breaking task that would result in future cuvees of fine wines. They were greatly mistrusted, underpaid and generally abused. 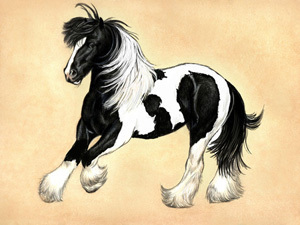 I remember my consternation when the local farmers feared the theft of their horses when I even as a young child, could readily tell that the Gypsies had great looking and much loved horses that bespoke of fine breeding practices whereas our local farmers had old heavy-bred and overworked sway-backed ones! I also remember being in the grocery store in the village when a young Gypsy man coming behind me and asking for a bag of sugar was very uncivilly required to put his money on the counter first, lest he run off with the sugar. I had not had to show my money but had been tended to with proper etiquette. It was appalling, even to a young child such as myself. So I pretended to remember I had to buy some sugar myself, then handed it over to the young man and told him, 'now you can pay". I was gratified with a beautiful smile. I wanted to run away with them, learn to handle the horses and maybe even ride them, learn their songs and dances, wear their same long skirts and shawls.. of course I would in due time but it was slow and patient waiting for me the city girl, until I could find my roots and give them breath, water and fire. In the meantime I nourished myself on the music of Django Reinhardt who was often played on the radio. I did make my own pilgrimage to Saintes Maries de la Mer in June 1980 accompanied by my two sons. In their native India the Gypsies worship the Devas who faithfully serve the Lord. The Devas also manifest through the elements and everywhere they went, the Gypsies continued to praise and worship God through the Devas in the stones and mountains, the springs and rivers, the winds and the fire. Fire is essential to the Gypsy people who often gather around it to play music, sing, dance and tell the old stories. Gypsies know the healing powers of water, herbs and stones. Most Gypsy women make their own skin potions and powders, making great use of henna for the hair and skin decorations such as kohl for the eyes. All gypsy women are adorned with special gems and crystals. All my Ancient Gypsy Spells are done outdoors around a large fire! Elements of the Earth are used for dispelling negative energies, blessing the space and grounding. Herbs and other offerings are given to the fire and prayers are sent to the Devas through the smoke, wonderfully scented. Drumming, specific mantras and dances are an integral part of each and every Ancient Gypsy Spell!! My personal tried-and-true Ancient Gypsy Spells and Rituals are always done around a fire and have a unique elegance, striving for harmony and balance with all creation around. They draw on the esoteric plane from all of the elemental energies from Northern India all through to the rest of the world, the many regions travelled by the Gypsies during hundreds of years. There lies their power, and they were directly taught to me through my own Guides and Teachers. A comprehensive Tarot reading is ALWAYS recommended particularly if your situation is complex or unclear. Please specify that you are interested in an Ancient Gypsy Spell when you book your reading. We will use the Visconti Tarot, the original Tarot sponsored by the Visconti family in the 15th century and considered to be the oldest Tarot used in Europe. It supports well the energies of my Ancient Gypsy Spells. For those who do not wish to work with a Gypsy Spell Kit, I am now offering for the first time these Ancient Gypsy Spells to help you resolve your most unique and personal situations. 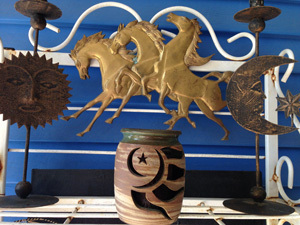 A time-honored ANCIENT GYPSY SPELL will be selected that is best suited for you. The spell-casting will be done on your behalf. NOTE: Each ordered Ancient Gypsy Spell is cast for you in total privacy around a Gypsy fire according to the Ancient Gypsy Tradition with drum rhythms and traditional chants. When you order a Gypsy Spell to be cast for you, we will email you to inquire about your specify area of concern. We will also notify you of the date and time when your personalized Gypsy Spell will be cast for you. You will receive a photo of the fire that was created for you (before offerings were given to it with your prayer) upon request (via e-mail). These generous salts + herbal + flowers baths are designed to cleanse, renew, revive and enhance specific aspects of our lives. Each one is carefully blended by myself according to the Ancient Gypsy tradition and formulas with Himalayan Salts, Sea Salts and hand-picked botanicals from my own gardens. 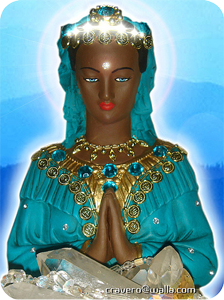 Each finished bath is blessed on my Gypsy altar dedicated to Sainte Sarala-Kali and the Three Maries. NOTE: Shipping is included within US. We cannot ship herbal items to some countries, please inquire before ordering. Overseas postage is extra. These unique and complete Gypsy Spell Kits are easy to use yet powerful! By doing your own Gypsy Spell work you will increase your intuition and spiritual strength as well as develop inner wisdom. You will be working with fire, earth, air, water and ether!! You will continue to benefit from the powers inherent in magical herbs and gemstones! I have brought together my extensive knowledge of herbs and of gemstones to create these amazing and exquisite Gypsy Spell kits . Those who have known me for a while can attest that I have always worked with herbs, for my own personal and family medicine as well as for ritual work. I have always favored certain gemstones and minerals. I am seen daily swearing special rings or necklaces or both, not for vanity but always chosen specially for the tasks at hand, never by chance. My house, temple and gardens are also punctuated with special rocks and gemstones among the many cultivated plants. This is part of my heritage and I now chooses to transmit these powerful secrets to others through the use of these beautiful and powerful Gypsy Spell kits. A delicately blended herbal and Himalayan salt bath for cleansing & blessing yourself. A complimenting exquisitely fragrant oil to anoint yourself with for your spell-casting. Specially chosen Incense as offering to the Devas and to facilitate your prayers. A beautiful candle in a complimentary color and scent to augment the magic and so that the Fire element may nourish and carry your prayers upward to the Devas. A beautiful amulet necklace/mala made of exquisite and specific stones and gems beads or chips chosen specifically to elicit and increase your magical goals. Even after you have finished working your spell, you will be able to wear this gemstone necklace anytime you wish to renew or empower yourself anew! A hand-written invocation and/or sacred mantra for your Gypsy Spell and to help you towards manifesting your goals. As always each kit will be put together one at a time, for each specific client with great care and attention. Because special jewelry will be created for each chosen kit, a client may expect their order to be filled in about 2 weeks. ALL orders within the US come with FREE SHIPPING!!! ANITRA'S GYPSY SPELL KIT: "LOVER OF MY DREAMS!" - To bring your lover closer in your physical presence and/or in your dreams. To foresee the man/woman who will be your soul mate in the future. To smooth and enrich communications between lovers separated by circumstances. TSARINA'S GYPSY SPELL KIT: "ABUNDANCE IS IN THE SHARING!" - To accrue abundance in all areas of your life - To enrich your sense of life and generosity - To help overcome feelings of lack and want - To help bring many blessings to you and your house. NOURIMA'S GYPSY SPELL KIT: "IN THE LIGHT OF THE STARS!" - To open your eyes and heart to untold possibilities - to help lessen fear and timidity - To help foresee the future and devise attainable goals for yourself = To help with wise choices and decisions. ESMERALDA"S GYPSY SPELL KIT: "MY STRONG FREE SPIRIT!" - For courage in the face of obstacles and adversity - To overcome past defeats and negative thought-forms - To affirm one's unique blessings and choices - To help increase creativity. MICAELA'S GYPSY SPELL KIT: "MY BEAUTIFUL LIFE"
- For inner and outer beauty - To help feel and exude personal beauty and goodness of heart and soul = To perceive and honor the beauty all around oneself. ZANAIDA'S GYPSY SPELL KIT: "LUCK IS UPON ME!" - For luck on the road, games of chance, new endeavors and projects - To help increase your ability to come ahead in all your activities. ZELDA'S GYPSY SPELL KIT: " AT THE WELL OF LIFE!" - For physical strength and wellness - To help overcome physical weakness and /or illness - For balance and joy in living and in nature. TAMAR'S GYPSY SPELL KIT: 'AND THE CHILDREN WILL DANCE!" - For fertility - To help promote health of expectant mother and child - For protection of mothers and children. THIS PAGE IS PROUDLY FOUNDED IN ANSWER TO THE ACTION OF MR. NICHOLAS SARKOZY - PRESIDENT OF THE REPUBLIC OF FRANCE - WHO IS AT THIS VERY MOMENT EXPELLING ENTIRE GYPSY FAMILIES OUT OF FRANCE CONTRARY TO THE IMMUTABLE LAWS OF THE EUROPEAN COMMUNITY WHICH GUARANTEE FREE PASSAGE AND RIGHT OF RESIDENCE TO ALL EUROPEAN CITIZENS. PLEASE WRITE TO YOUR NEAREST FRENCH CONSULATE OR EMBASSY AND NOTIFY THEM OF YOUR OUTRAGE AT THIS GLARING INJUSTICE AND ACT OF OUTRIGHT UNMITIGATED RACISM. LONG LIVE FREE PEOPLE EVERYWHERE. LONG LIVE THE GYPSIES OF FRANCE. UPDATE: IN 2012 FRANCOIS HOLLANDE WAS ELECTED TO REPLACE NICOLAS SARKOZY AS PRESIDENT OF THE REPUBLIQUE FRANCAISE. UNFORTUNATELY THE POLICIES OF DISCRIMINATION AND ABUSE AGAINST THE ROMA PEOPLE HAVE ONLY INCREASED. THE UGLY HEAD OF FASCISM IS ON THE RISE AND WE SHOULD BE VIGILANT AND ACTIVE IN DEFENDING THE OPPRESSED FOR THE "OTHER" CAN AND WILL SOON BECOME US!! STAND UP FOR YOUR RIGHTS! SPEAK UP AND SUPPORT THE GYPSIES OF EUROPE.